Welcome back or welcome for the first time if you're heading here from a link on the lovely Ann Melvin's blog. 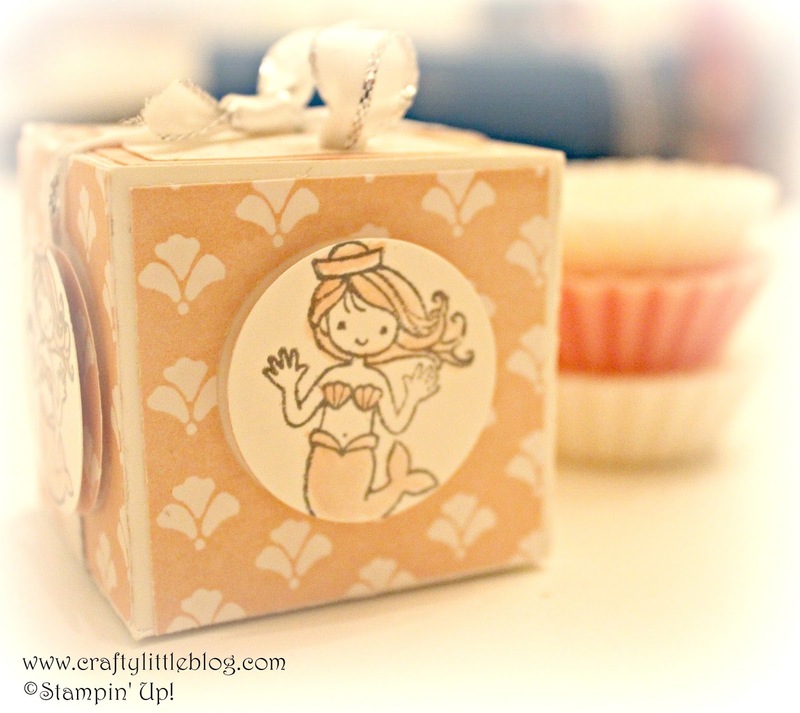 So this is week 2 of the December design challenge for the Happy Crafters team using the Message in a Bottle stamp set and other Stampin' Up! supplies. In my video tutorial I make the lemon lime twist foiled version at the end of this post. 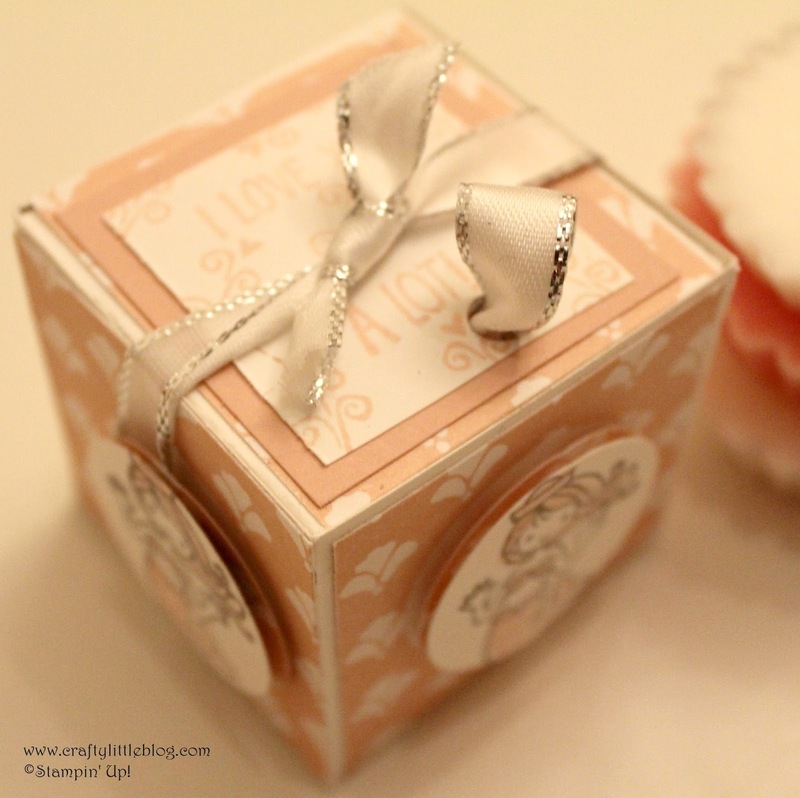 This week I opted to make a 3D project rather than a card and came up with this cute little Powder Pink and Whisper White gift box which fits 3 hand made wax melt tartlets inside. This is perfect for a wedding shower gift or a wedding favour if the theme is remotely mermaid orientated and I do know people who mermaid or ocean theme their weddings. It's also great for a girlie pamper party gift or can be used for something other than wax melts. It could hold home made biscuits, or chocs or a handmade bracelet or some little lip balms. 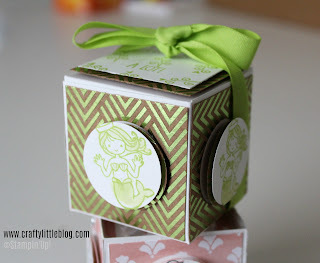 There are no limits as to what you can pop inside this cute little girlie box. I started off by making a 2 x 2 x 2 box in whisper white giving it a lid that slots into the box. I added the little loop of ribbon so that it was easier to open and matched this with the ribbon tied around the box. 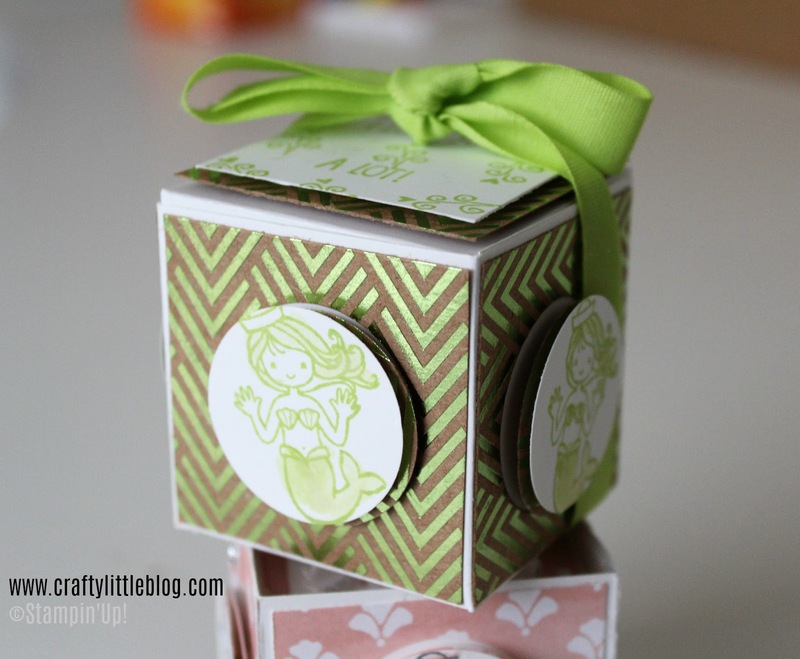 This is in the current annual Stampin' Up! catalogue. Then I added a layer of Fresh Floral DSP in Powder Pink using the side which kind of resembles shells to carry through the mermaid/ocean theme. I made these just an eighth of an inch smaller than the box sides. Before gluing these on with tombow liquid adhesive I punched out a circle using a one and a quarter inch punch in each piece of DSP. I wanted the effect to appear random so didn't measure and went for both central and off central positioning. 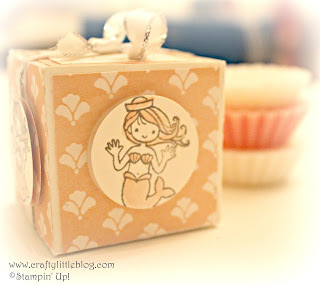 I kind of wanted to give the effect of the little mermaid floating around the edges of the box in bubbles. For this reason I took the punched circle of DSP and using dimensionals secured it on top of the punched hole and then punched the mermaid using Basic Gray ink watercoloured with Powder Pink ink using an aqua painter out of Whisper White with the same punch and secured on top of the disc of dsp with more dimensionals to allow the layers to lift off the background. To finish off before adding the ribbon, I covered the edges of the ribbon pull on the inside of the box lid by adding a layer of Powder Pink cardstock. I then took a piece of Powder Pink cardstock and added that with dimensionals to the top of the box and then added a smaller piece of Whisper White which I'd stamped with the sentiment from the Message in a Bottle stamp set which said I Love You and another which said A Lot and then stamped some of the tiny heart flourish from the same stamp set randomly around the wording. I did all of this stamping in Powder Pink ink. Although this is a really strong and secure little box I added some extra ribbon just for decoration. This is the version I made in my video tutorial, click here for that. Many thanks to Ann for allowing us to share her platform and give some inspiration on using this gorgeous stamp set. Have a very happy Christmas and I'll be back again on Boxing Day with another non-Christmasy piece of craft for you to start you thinking about projects for 2018! Thanks Ann. I'm just uploading a video tutorial to You Tube showing a different version using Foiled Frenzy. I'll add the link to the blog post when it's ready.